1. In custody disputes, the paramount concern is the welfare and well-being of the child. 3. Exception: if there are compelling reasons, custody may be denied and granted to another person under Article 214 of the Family Code. 4. Compelling reasons for a mother to lose custody: neglect; abandonment; unemployment and immorality; habitual drunkenness; drug addiction; maltreatment of the child; insanity; affliction with a communicable illness. Notes: (1) Click the graphic to download a free PDF newsletter on this topic. This PDF is for your personal, non-commercial use only; you must not upload it to any website, blog, file-sharing platform, or the cloud. (2) Please also read my related posts titled Visitation rights over illegitimate children and What surname should illegitimate children use? 1. 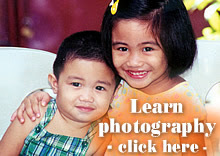 General rule: custody of a child below seven years of age belongs to the mother. 2. Exception: if there are compelling reasons, custody may be denied and granted to another party, as provided for by Article 214. Petitioner contends that she is entitled to the custody of the minor, Gardin Faith, as a matter of law. First, as the mother of Gardin Faith, the law confers parental authority upon her as the mother of the illegitimate minor. Second, Gardin Faith cannot be separated from her since she had not, as of then, attained the age of seven. Employing simple arithmetic however, it appears that Gardin Faith is now twelve years old. In custody disputes, it is axiomatic that the paramount criterion is the welfare and well-being of the child. 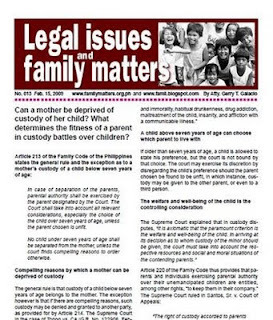 In arriving at its decision as to whom custody of the minor should be given, the court must take into account the respective resources and social and moral situations of the contending parents. Parental authority and responsibility are inalienable and may not be transferred or renounced except in cases authorized by law. The right attached to parental authority, being purely personal, the law allows a waiver of parental authority only in cases of adoption, guardianship and surrender to a children’s home or an orphan institution. When a parent entrusts the custody of a minor to another, such as a friend or godfather, even in a document, what is given is merely temporary custody and it does not constitute a renunciation of parental authority. Even if a definite renunciation is manifest, the law still disallows the same. The general rule is recommended in order to avoid many a tragedy where a mother has seen her baby torn away from her. No man can sound the deep sorrows of a mother who is deprived of her child of tender age. The exception allowed by the rule has to be for “compelling reasons” for the good of the child; those cases must indeed be rare, if the mother’s heart is not to be unduly hurt. If she has erred, as in cases of adultery, the penalty of imprisonment and the divorce decree (relative divorce) will ordinarily be sufficient punishment for her. Moreover, moral dereliction will not have any effect upon the baby who is as yet unable to understand her situation. This is not intended, however, to denigrate the important role fathers play in the upbringing of their children. Indeed, we have recognized that both parents “complement each other in giving nurture and providing that holistic care which takes into account the physical, emotional, psychological, mental, social and spiritual needs of the child.” Neither does the law nor jurisprudence intend to downplay a father’s sense of loss when he is separated from his child: While the bonds between a mother and her small child are special in nature, either parent, whether father or mother, is bound to suffer agony and pain if deprived of custody. One cannot say that his or her suffering is greater than that of the other parent. It is not so much the suffering, pride, and other feelings of either parent but the welfare of the child which is the paramount consideration. 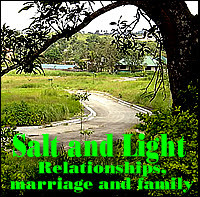 For these reasons, even a mother may be deprived of the custody of her child who is below seven years of age for “compelling reasons.” Instances of unsuitability are neglect, abandonment, unemployment and immorality, habitual drunkenness, drug addiction, maltreatment of the child, insanity, and affliction with a communicable illness. If older than seven years of age, a child is allowed to state his preference, but the court is not bound by that choice. The court may exercise its discretion by disregarding the child’s preference should the parent chosen be found to be unfit, in which instance, custody may be given to the other parent, or even to a third person. In the case at bar, we are being asked to rule on the temporary custody of the minor, Gardin Faith, since it appears that the proceedings for guardianship before the trial court have not been terminated, and no pronouncement has been made as to who should have final custody of the minor. Bearing in mind that the welfare of the said minor as the controlling factor, we find that the appellate court did not err in allowing her father (private respondent herein) to retain in the meantime parental custody over her. Meanwhile, the child should not be wrenched from her familiar surroundings, and thrust into a strange environment away from the people and places to which she had apparently formed an attachment. Moreover, whether a mother is a fit parent for her child is a question of fact to be properly entertained in the special proceedings before the trial court.